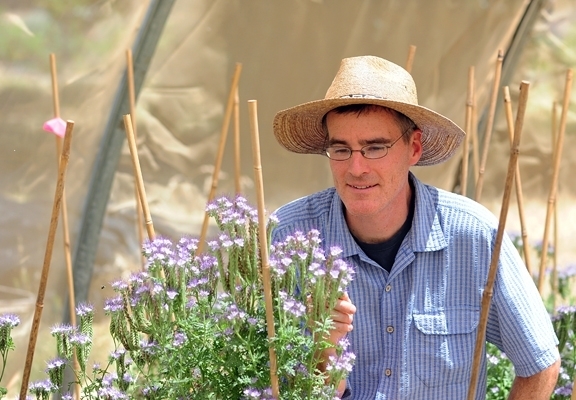 DAVIS--Pollination ecologist and Chancellor's Fellow Neal Williams, professor of entomology, UC Davis Department of Entomology and Nematology, has been named one of the Highly Cited Researchers in the 2018 list just released by Clarivate Analytics. Williams is one of only 19 UC Davis researchers so honored and one of 10 from the College of Agricultural and Environmental Sciences. The company, based in Philadelphia, honors exceptional scientists and social scientists who have demonstrated significant influence by publishing multiple papers that rank in the top 1 percent by citations in a particular field and year, over a 10-year period. Williams joined the UC Davis Department of Entomology (now Department of Entomology and Nematology) in 2009 from the Bryn Mawr (Pa.) College. He holds a bachelor's degree from the University of Wisconsin, Madison, and a doctorate from the State University of New York, Stony Brook. He was named a Chancellor's Fellow in 2015, a five-year program that granted him $25,000 to support his research, teaching and public service activities. The program, established in 2000 to honor the achievements of outstanding faculty members early in their careers, is funded in part by the Davis Chancellor's Club and the Annual Fund of UC Davis. Clarivate Analytics' services focus largely on analytics, including scientific and academic research, patent analytics, regulatory standards, trademark protection, pharmaceutical and biotechnology intelligence, domain brand protection and intellectual property management. The services include Web of Science, and EndNote.